Google Places for Business is a free service provided by Google that allows you to promote your offline business online by registering or "claiming" your Google Places Page for your business. By registering your business's Google Places Page, you can create a business listing that helps you achieve better rankings in local search results generated by Google, in addition having the ability to customize your page and add other promotional items like photos, video, menus, coupons, etc, providing your customers with all of the information they need to shop with you. All you need to do is register and verify your business’s information with your Google Account (you can set up a free one, if you don't already have one), then you can customize your Places Page to further increase your business's Search Engine Optimization (SEO) potential and the likelihood that people searching online and via mobile devices will walk into your local store. Google Places for Business is an excellent way to maximize your online marketing potential for your offline business through local search. It provides localized search results based on the geographic area where you’re conducting your search, or geo-specific search terms. For example, if you searched for “Chicago BBQ Ribs”, you’d see results like those pictured below, where various locations that offer BBQ Ribs in the Chicagoland area are listed next to a map image highlighting each location. Claiming your Google Places page is a fast and free way to improve the likelihood that your business location will be found near the top of the Google Search Results for searches related to your business. Your Google Places page can also act as both a temporary replacement for a website that is under construction, as well as another tool for promoting your company and its products and services. Also, there are advantages to being an early adopter of your Google Places page, as you can put yourself ahead of your local competition by utilizing one more way to drive traffic into your brick-and-mortar location. Since claiming your Google Places page is free, you can get started using this marketing avenue at no cost, and when you’re ready, you can later make the investment in trying Google Tags (a paid service to help you promote your Google Places listing) and/or Google Adwords (their pay-per-click advertising service). To get started and claim your Google Places for Business page for your offline business, search for your business online with Google and see if you already have a listing. If you do, click "Edit this page", and go through the process of verifying your ownership. 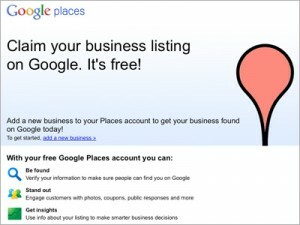 If you don't find your business already listed, you can still register with Google Places and add it. Check out this brief video overview of Google Places for Business (below), and as always, SSS for Success is here to help, should you need someone to set up your Google Places page for you (just fill out our Contact form, with “Please Set up My Google Places Page” in the subject line).